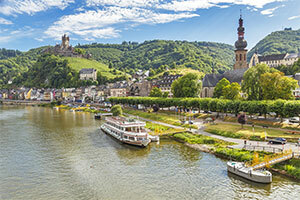 Full of charm, the Mosel Valley region is the perfect choice for those looking for peace and authenticity. The Mosel River, smaller than the Rhine, winds peacefully through Germany’s top wine producing region. Here you can enjoy exploring fairy-tale castles, strolling through cobbled towns and taking time out at any of the multitude of terraced vineyards. Our campsite is the ideal location to enjoy a relaxing family holiday in the region. Set high on a hillside and offering stunning views of the rolling countryside, a chairlift ride takes you from the site to the pretty town of Saarburg in the river valley below. Bernkastel-Kues Twin villages on either side of the Mosel. Bernkastel, on the north bank of the river, is a colourful village with a pretty Marktplatz lined with halftimbered buildings with carved façades. For a wonderful view of the river visit the ruins of the 13th century Landshut Castle on a promontory above the town. During the summer a return boat service runs daily to Trier. A bridge crosses the river to Kues where you can visit the St Nicklaus hospital founded by Nikolaus Cusanus, the 15th century philosopher. There are regular wine tastings and amongst the Gothic buildings you will find the Mosel-Weinmuseum. Mettlach An important centre for the ceramics industry. The unusual presentation Keravision and the Museum of Villeroy and Boch (the well known local ceramics firm) now occupy the former monastery buildings. The museum shows the history of ceramics using displays of the firm’s products. Mettlach is situated in a large loop in the Saar, known as the Saarschleife. Neumagen The town lies over the Roman settlement of Noviomagus. An important part of the excavation of the Roman settlement is a sculpture of a wine-laden ship, and a smiling sailor. The original can be seen in the Landesmuseum in Trier however there is a copy on display here, in the main square. Luxembourg City The capital of the Grand-Duchy is spectacularly situated on the banks of the Pétrusse and Alzette rivers. In the centre of the town you will find the Place d’Armes, a tree-lined square with restaurants and open-air cafés, and the Grand Rue, a pedestrianised shopping street. Luxembourg City is full of museums and varied attractions, which make it a worthwhile day trip, there are a few festivals held in the city including the ‘Schueberfouer’ funfair at the end of the summer. To find your perfect campsite in the Mosel Valley please use our interactive site finder, call our knowledgeable customer advice team on 01 242 1901, or go straight to the individual campsite pages.